SecurWall is the most user-friendly PC firewall and personal desktop security solution available today. SecurWall is a must-have security measure for any PC that connects to a private network or the public Internet. Once you&apos; ve been compromised, your personal data including your home, business and online bank accounts, credit card information or any other confidential material, that rests on your hard drive can become public.. No matter where you use your computer, whether remote or at home, whether dial-up or an always-on broadband Internet connection, it gives you complete confidence that your precious business, personal, financial and other data is safe and secure. SecurWall offers easy to manage rule-based security policy by constantly operating in the background. Rules for applications, trusted IP addresses, ports, protocols can be customized to support and secure any network configurations or requirements. Designed for high performance, but still saving computing resources, SecurWall will always protect you while surfing, chatting, gaming, or any writing emails. If an intrusion attempt occurs, it detects it in real-time and blocks it by default. Also, if unauthorized application try to access the Internet, SecurWall blocks it by default, asking you to take course of action(to allow/deny and/or block it&apos; s access to the internet). 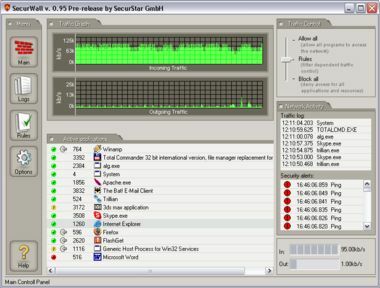 The personal firewall also offers the possibility to create an anonymous encrypted Internet tunnel for anonymous surfing. SecurWall is extremely easy to use even for not experienced users. It easily installs on your system by automatically detecting your Internet connection and setting. SecurWall is the winner of the prestigious Sc-Magazine Award 2006 as " Best Desktop Firewall" .SecurWall is also available as a corporate version and can be installed and managed centrally with a central management console.